Almost no one is taught this information. If you are lucky enough to have stumbled across this article, consider yourself exceeding fortunate and unusually well informed. Send this on to friends (especially those with darker skin color, who need this information the most), but don't try to argue with your oncologist or doctor about this issue: they don't know any better. They were never taught this information, and since they're wearing blinders that have been installed by the conventional cancer industry, they will not be able to accept any information that comes to them from outside the "high priests" of conventional medicine. To state it bluntly, most oncologists are idiots when it comes to nutrition and vitamin D. Most doctors don't even understand the basics of vitamins, minerals, essential fatty acids and phytonutrients. They're not stupid people, it's just that they've never been taught this information, and they consider it to be too "alternative" to embrace. Doctors have very fragile egos and don't like to be challenged by information they didn't think of first. By refusing to teach any of this information to black men and women, the cancer industry is engaged in a campaign of enforced ignorance that is, in effect, racist in its effect. The industry is not merely destroying the health of human beings; it is doing so in a way that has dire implications for black women in particular. The cancer industry claims to be empowering women with breast cancer screening, but it is actually guiding them towards a particular diagnosis and treatment plan that enriches the pharmaceutical companies. Keeping women ignorant (especially black women) is a key strategy in this plan, for if women were empowered with the real facts about how to easily prevent and reverse breast cancer, the cancer industry would lose millions of customers and billions in profits. Just as empowered, educated women were once considered a threat to the political foundations of the United States (because men were the only people originally allowed to vote), empowered, educated women are right now considered a threat to the profits of the cancer industry. 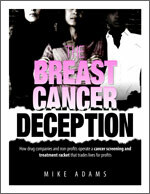 The more a woman knows about how to prevent her own breast cancer through common foods, herbs, sunlight, exercise and avoidance of cancer causing chemicals, the less control the cancer industry has over her, and the less easily they can exploit her body to create a revenue stream that enriches the rich, white men who head drug companies. These tactics by the cancer industry are an affront to women everywhere. Instead of prevention, the industry proposes screening and disease management. Instead of education, the industry censors information and isolates women from real solutions by discrediting all forms of medicine it does not control. The result is the mass exploitation of women and their bodies. In the United States today, women are routinely maimed (mastectomy procedures), chemically assaulted (chemotherapy) and intentionally subjected to cancer-causing treatments (radiation therapy), all in the name of "medicine." As an answer to all this, NaturalNews will be bringing you natural anti-cancer solutions in subsequent reports and articles. My position on all this is very clear: I support the empowerment of women. I am a proponent of education, not medication. And I believe that black men and women need to be told the truth about the sunlight / cancer link. I also think that women need to be taught how to prevent breast cancer through foods, herbs, and natural therapies like sunshine and exercise. It is crucial that we start to prevent this disease, rather than waiting for everybody to be diagnosed and then treat them at great expense. I also believe in the sanctity of human life and that all medical practitioners must honor the bodies, minds and souls of patients. To exploit a patient's body as a profit center is highly unethical and immoral. To deny them access to information about herbs and nutrients that could save their lives is downright evil. And to push cancer screenings and chemical treatment onto women while simultaneously censoring, discrediting and outlawing genuine cancer prevention solutions is so sinister that it ranks right up there with genocide. Make no mistake: the cancer industry has become a corporate profit machine that causes great harm to men and women of all races and nationalities. In its endless quest for profits, the industry has forgotten that medicine was supposed to be about helping women live healthier, happier lives, free of breast cancer and empowered with the knowledge necessary to do so. Instead, is has devolved into a system of enforced ignorance, patient exploitation and harmful profiteering. That's the cancer industry today.